Surely, at no point in the ancient astronomer’s mapping of Solar system and the earth orbit around the Sun, would he have needed to rely on at all earth magnetism, magnetic needle, earthly seasons, apparent Sun path or the notion of Hemispheres. It’s a dead give away, but why is that? Just mere astronomical observation would have sufficiently given the division of the ecliptic, first into 12 x 30 degrees sectors – for Chinese zodiac -, then a further 24 x 15 degrees, known as 24 Solar Terms. Consequently, computations done to arrive at Flying Star charts in Flying Star Feng Shui and birth charts in Four Pillars of Destiny Bazi and Nine Star Ki Astrology will be based in astronomical, rather not seasonal, observations. our 4-day master classes and distance learning training, to ensure your autonomy and competitiveness in the field. around the sun, resulting in 24 Solar Terms and 12 Primary Hexagrams. 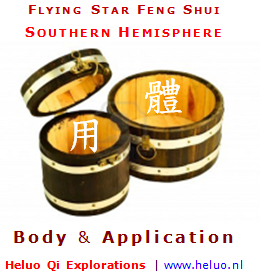 Since these systems for their base computations rely on astronomical findings, and so that such mapping of the earth orbit comes to concern of the entire planet, there couldn’t be a Hemispheres related difference to concern of basic calculations done to arrive at Flying Star charts for Fei Xing Feng Shui, or birth maps for Four Pillars of Destiny and 9 Ki. Any extensive article on the subject of ‘difference’ for the Hemispheres would seem unnecessitated, were it not that arguments have been persistent enough to be devoting a whole discourse on the subject. The ancient scholars no fools, they would have known exactly what they were doing. Rather than at all concerned with seasons, seasonal change, apparent Sun path, or even earth magnetism, the astronomer in his mapping of the earth orbit around the Sun found Twelve Primary Hexagrams, or Bi Gua, each Hexagram to span 30 degrees of Ecliptic. there is ‘no difference’ to build their reasoning around the exact same faulty hypotheses. In mind earth orbit around the Sun and where astronomical calculations derive from 24 Solar Terms – more precisely actually the Twelve Primary Hexagrams to derive from the Ecliptic -, it follows that, a thing like apparent season is not a player, earth magnetism is not a player, where the Sun appears in the sky at noon time is not a player. If these were not players, we still see half the population say these were in fact deciding the difference for Hemispheres, so there is little we can do than to go over each argument, which is only why above ‘one paragraph’ approach wouldn’t suffice. Here blog post then gives a synopsis to a 34 page chapter on the subject in our Four Pillars of Destiny Bazi class manual of 650 pages, so that I hope you will be able to find sufficient clues here in order for you to be diving into the subject, the more if you have been minding other’s health and fate as a teacher or professional consultant. 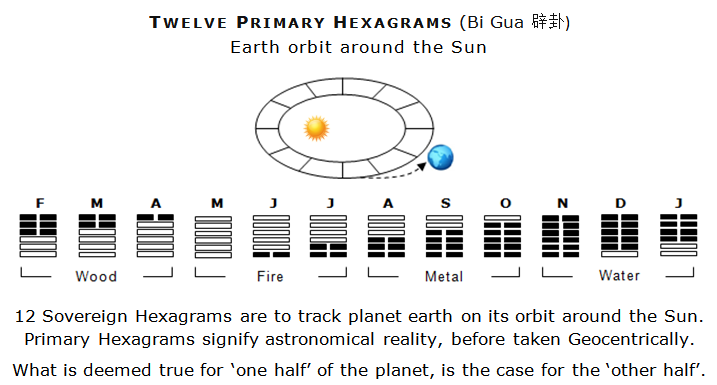 The problem of the matter is, that we can use the exact same range of Twelve Primary Hexagrams – or 24 Solar Terms for that matter – that just we had projected on the earth orbit around the Sun, on anything else. If the Primary Hexagram to denote December Solstice for the planet as a whole, is to signify Zi Rat 子, same Hexagram may be used to signify midnight. A disturbing amount of the resultant Babylonian Speech, comes from exactly taking the Earthly Branches, the whole of the 24 Solar Terms, to the domain of seasons here on earth. If it is Summer on one Hemisphere, it is Winter on the other Hemisphere, so much will be clear. But, if planet earth is at its closest approach to the Sun at a certain time, this is so for the whole planet, continents or not, oceans or Hemispheres or not. If we agree that ‘noon time’ is Wu Horse 午 for a certain city, while it might be at the same time a different ‘zodiac sign’ for any other city, that is ’24 hour clock’, while if it is June Solstice for one Hemisphere, it is June Solstice for the other Hemisphere. Some will then point out that “yes, but in December, it is Winter on the Northern Hemisphere, while it is Summer on the Southern Hemisphere”. Quite so, but in our here using Zi Rat 子 in light of earth orbit around the Sun, we were actually not talking about apparent season, or time of day, or which organ Zi Rat would be then good for. We are still in the realm of earth orbit around the Sun. We all know that Wu Horse 午 could be taken to signify noon time, but ‘noon time’ comes around the corner once the 24 hour clock becomes our topic of study, whereas in the realm of earth orbit, Wu Horse is not ‘noon time’ of even Summer or Winter, as it is to signify the location of earth, at that time, farthest from the Sun in the month of June, which is a global ‘event’. Pretty much straightforward: looking upwardly – then at the time not minding the play of light and dark here on earth, where constellations are, or even the notion of apparent season – the ancient astronomer no more than noted earth’s orbit around the sun, while being able to doing so, simply not would he have been reliant on earth magnetism – thereby not bothered with compass or ‘a’ magnetic needle -, not concerned where on the planet – or even on which Hemisphere – his feet rested, much less in his mapping of 12 Primary Hexagrams would he have to worry about apparent season, Sun path, climatic conditions, weather, or any other geographical conditions here on earth. We need distinguish between computations based in astronomical observations and those eventual adaptations done to account of conditions here on earth, which is the difference between Body (Ti 體) and Application (Yong 用). There is but one earth inner core to generate but one earth magnetic field. It springs from North Polarity which is located near the South Geographic Pole on the Southern Hemisphere, while then it travels to South Polarity which is located near the North Geographic Pole on the Northern Hemisphere. Everything else in the realm of computations, is however not decided by ‘Hemispheres’, but by earth’s position on the ecliptic, its distance at any time relative to the Sun. We do not adapt computations based in locality here on earth, or even seasons here on earth. Naturally, once then basic computations established (Body 體), we adapt and adjust to concern of Application (Yong 用), for example geographical considerations, but which is only a ‘given’, as we would further adapt and adjust for reason of just about anything. Yet, in all of this, Twelve Primary Hexagrams as seen within context of the earth orbit around the Sun become pivotal. Derived from 24 Solar Terms then come Twelve Primary Hexagrams (Bi Gua 辟卦), which still at the level discussed here are to denote distance and position of planet earth relative to the sun. With the sun pretty much off-center, planet earth on its orbit and during the course of a Solar year would constantly change position and distance relative to the Sun. Earth will be at its closest approach to the sun at Perihelion – early January -, while at Aphelion – July -, the planet reaches farthest from the Sun. It goes without saying that, earth as a whole will be at Perihelion, then Aphelion. Planet earth thus alternately moving closer to and farther from the Sun, this will have energetic consequence, as massive powers cast upon earth by the Sun would have terrestrial forces surface and subside, which push-pull is at the exact message of Primary Hexagrams – also called Sovereign Hexagrams. 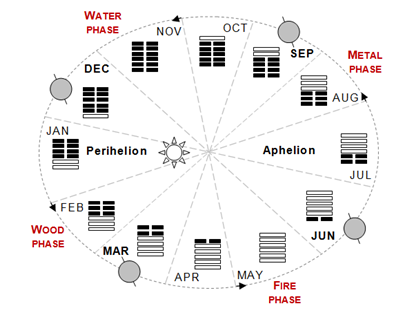 Here are Twelve Primary Hexagrams astronomically, as they depict the progression of Solar months. As this progression would be illustrated along Primary Hexagrams, it helps if within context, you look onto a Hexagram in a certain way. At the plane of earth progressing on its annual orbit around the Sun, and consequently terrestrial forces waxing and waning (surface, subside) you may regard Primary Hexagrams as a ‘see through’, where the lower Trigram denotes the solid planet, the upper Trigram planetary atmosphere. Any line or line change in the lower Trigram signifies an event inside the planet, any line or line change in the upper Trigram denotes an atmospheric event. If you follow progression from the December ‘Birth of Yang’, then with these Twelve Primary Hexagrams a stunning dvd may unfold, where you’ll see terrestrial forces to surface and sink along the course of any Solar year. With virtually all teachers well able to tell you what Primary Hexagrams would bode once projected along a 24-hour clock, in my entire time as a practicing metaphysician since 1973, I have met but one person aware of the astronomical connotation of Bi Gua, which would be at the ultra dynamic advance and retreat of terrestrial forces. Four things become apparent from the progression of Twelve Primary Hexagrams. Once still at the plane of earth orbit, their depiction is clearly astronomical, dynamics valid on a global scale. If we let the progression of surfacing energy start at December, a new cycle of ascending terrestrial forces sets in at the December Solstice, an event known as ‘Birth of Yang’. Meaning, this is the beginning of a new cycle, which is not same as the start of a Solar year. With another Yang line having been added for January, finally at the beginning of February, terrestrial forces are ready to surface and fill the atmosphere. The Dragon – the Fire Principle – comes to life. Once still at the domain of earth orbit, and in our describing Wuxing Five Elements, we refrain from explaining Wuxing along the natural cycle, as if Wood was expansion because it is to depict growth of vegetation. At the plane of Primary Hexagrams and astronomy, Wood is understood as planet earth ‘escaping’ from Perihelion, the then surfacing (expanding) of terrestrial forces, which would make February strong in Wood, globally, November strong in Water, globally. ‘Wood’ here understood as ‘Expansion of the Fire Principle’, ‘Water’ at this point not understood as H2O or linked to season. Momentary seasons and other local conditions would handle Wuxing at a completely different domain and come in later, so with one domain at Wood, it could well be the other domain was at Metal. It’s not like the planet is free to go wherever it sees fit, or it would be catapulted away from the Sun to forever disappear into oblivion. Nothing at the plane of magnetic push-pull is voluntary, there is no democracy. For lack of better wording, but to paint the picture, the ancients noted how the sun will ‘inhale’, commanding terrestrial forces to surface with planet earth moving farther from the Sun, such that, here, planet’s moving farther away from the Sun, would be noted by the ancients as ‘Expansion’ – or growth, if you will -, hence Wood, until around the month of May, the atmosphere is saturated, noted as Fire. The attentive reader will note that, just as Zi Rat 子 can signify a portion of earth orbit, just as it can signify a portion of the 24 hour clock or an organ, Wood can be understood in the realm of earth orbit around the Sun, a time of day, a certain organ or character trait. It’s technical, but it comes down to, you can indiscriminately use the range of Twelve Primary Hexagrams to understand any given domain, but it is best not to pull a certain significance out of one domain, then take it for ‘same’ in the other domain. Once planet earth at its point farthest from the Sun, just before – if we let it – it would disappear into utter darkness, the Sun commands earth to move back closer to the Sun, then the Sun ‘exhales’, causing for terrestrial forces to once more subside, noted by the ancients as ‘Contraction’ (of the Fire Principle), hence Metal. If one city or Hemisphere is at February, the other city or Hemisphere will be at February, such that we define a Solar year as to start with the Sun passing through 15 degrees Aquarius, usually 3, 4 or 5 February. We start a Solar year at February, while rather not would we altogether let a Solar year start at ‘a’ notional Li Chun, if here Li Chun translates as ‘Beginning of Spring’, or we’ll be back at running the risk of anyone to focus away from Primary Hexagrams for the earth orbit around the Sun, then zooming in once more on ecological seasons and go like ‘hey, if it said that a year is to start at Beginning of Spring, then surely, we’d have to start a Solar year in Brazil in August’. And that is exactly what happened, but more on how this may have come about further on. Please note that, just for reason that Li Chun translates as ‘Spring Begins’, Li Chun could as such not be taken as to define the start of a Solar year. Start of a Solar year is an astronomical event, rather not altogether a seasonal event. The definition doesn’t use the notion of ‘a’ Li Chun, where actually it says that, globally, we start a Solar year with the Sun passing through 15 degrees Aquarius. Therefore, looking up to note such ’15 degrees Aquarius’, not would the astronomer have thought ‘ah, beginning of Spring’, because he would have at that time not been concerned with planetary seasons. ‘Li Chun’ would have been exclaimed later, notably by any observer – perhaps some documenter – on the ground. While, by all means, same progression as above could be then used Geocentrically or Egocentrically, at this point it is imperative to note that here Primary Hexagrams denote Heliocentrism. Said differently, where the smaller bucket may neatly fit into the bigger bucket, we would bounce into conflict, were we to try make the bigger bucket fit into the smaller bucket. We need to distinguish between what is Body, what Application. That what is valid for the entire planet can be brought under Body (Ti 體). Very much based in astronomy, then anchored in the Chinese Solar calendar, definitions and calculations done to concern of Xuan Kong Flying Star Feng Shui and birth charts for purpose of Four Pillars of Destiny Bazi and Nine Star Ki Astrology, will be based in 24 Solar Terms. Most upon hearing ’24 Solar Terms’ will be indefinitely back to thinking ‘ah, so again seasons’, which is the whole point. To that respect, we may be only glad that the 24 Solar Terms hadn’t been at one point ‘explained’ by the hand of the 24 hour clock, or it would be harder even to get it across that, no, while still in the realm of earth orbit around the Sun and to obtain basic computations, 24 Solar Terms is to point to the division in segments of the earth orbit. As 24 Solar Terms come as identical for the planet as a whole, so would computations. Practically, this means that your calculations would follow same doctrine, irrespective of locality. If then after you had established the correct calculations (Body), you saw reason to ‘adjust’ due to apparent season, where the Sun is overhead your roof, this only comes with the territory, and it is Application. Surely, once then universal calculations gave us our Flying Star chart or our personal birth map, it is only natural – and so prescribed in fact – to then further adapt relative to local conditions, but such adjustments resorting under Application (Yong 用). However, the very purpose of Application (Yong) was to adapt to changing conditions, it is not to then see ‘a’ different ‘something’ at ‘a’ sea shore, then once more ‘a’ different ‘something else’ in a mountainous area, or ‘a’ Southern Hemisphere Winter against ‘a’ Northern Hemisphere Summer, then based on this, go to change whatever computations there had been earlier prescribed to account of Body (Ti). Body and Application also imply that, sure, two or more Primary Hexagrams cycles may be in effect at the same time for different domains. There is nothing against saying that, where ‘a’ certain Primary Hexagram would be true for the month of April, yet another Primary Hexagram would associate with a certain time of day for your Longitude. It’s just that, you’d have one such Hexagram progression formulated by the earth orbit around the sun, the other then linked to the apparent Sun path. Yet another progression of Primary Hexagrams could link to apparent season or chrono-acupuncture. In fact, no-one said that, if at any time we’d have a certain specific Primary Hexagram formulated by the earth orbit around the Sun for the entire planet, that we would then need see same Primary Hexagram being displayed by anything we saw around us, as we could well have the Primary Hexagram for February in effect for the planet as a whole, while time of day could give a Primary Hexagram of its own, while, if we were to look out from our window to note the weather, we’d give it yet another Primary Hexagram. However, we would never let the time of day or the weather decide on basic computations. Same difference with apparent season, where we may see the overall astronomical progression of Twelve Primary Hexagrams in accord with apparent season for one Hemisphere, while, what then we saw being displayed to account of apparent season but for the other Hemisphere may be on to a seeming different progression of Bi Gua, but it was really not. It just so happens that, if done for the Northern Hemisphere, the ‘astronomical’ Primary Hexagrams and the ‘seasonal’ depiction, may at any point run synchronous. If for the Southern Hemisphere, same astronomical Primary Hexagrams as for the Northern Hemisphere apply with regard to basic computations, you would by all means be using another set to fit local conditions, but in itself we would already do this, if even using Primary Hexagrams on the 24-hour clock. In fact, Ti will be prescribed at the level of definitions and overall computations, while it is only presumed understood that further adaptation and adjustments to concern of Yong would have to be made in full consideration of changing conditions, Hemispheres no exception. To that respect and where it comes to our adapting and adjusting to local conditions, the Hemispheres do not bode any exclusiveness, as you would adapt to your cities’ weather several times a day if need be, at least if your country of residence was The Netherlands. Just a quick example for a Bazi birth chart, while not involving Longitude or Latitude of birth – much less Hemispheres, since the Ganzhi 干支 calendar and to concern of formulating years and months is not based in Geocentric considerations. Circled are the Fire elements in this birth chart, but for a person that could be born on either Hemisphere. As a serious practitioner, you would have seen that, besides Body and Application, there has occurred a rather massive mix up in the metaphysical field as to what is Strength, then what Vibrancy, relative to Twelve Stages of Life. Bazi birth charts will be based in the Ganzhi calendar, which in the realm of months involves the annual earth orbit around the sun, thus irrespective of Hemisphere of birth. All concur that, if for this chart, month of birth was Si Snake 巳, such would have been decided by planet earth’s position along the ecliptic at that time (Solar month of May), rather not apparent season having anything to do with this, certainly not where Si Snake would be then otherwise also correlated with Wuxing Fire, which ‘Fire’ – as we will see – is by here context not about Strength anyway, but Vibrancy. 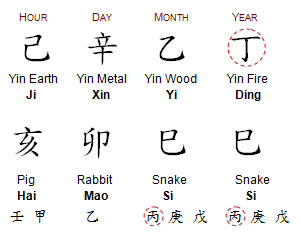 Day Master Yin Metal Xin 辛 born in May, which is Si Snake Branch 巳. Si Snake then contains Yang Fire Bing 丙 as its major God (hidden element), which at the plane of Ten Gods functions as Proper Power onto a Xin Day Master. Month of birth – and such identically so for either Hemisphere – decides on Strength of the Bazi birth chart, Strength of Day Master, Strength of elements in the chart, as this links to Twelve Stages of Life. If then birth took place on the Southern Hemisphere, Fire elements in above’s Bazi birth chart would be weaker due to momentary Winter season and Water elements would gain on Vibrancy – read once more: Vibrancy -, while, if birth took place on the Northern Hemisphere, Fire would be stronger due to momentary Summer season and Water elements – such as here Yang Water Ren 壬 in the hour Branch – would be seeing diminished Vibrancy. Note therefore that, a lot of Babylonian Speech in our field to concern of Hemispheres would have come from little more than anyone’s not distinguishing between Body and Application, then notably Strength and Vibrancy, as Strength and Vibrancy are not synonymous. It would only seem how teachers would have mileage to go instructing their students. Saying, if for here Bazi birth chart, the month of birth is Si Snake 巳, this is to communicate “ok, guys, note that at time of birth, planet earth was located at such and such distance from the Sun”. That is Body (Ti), and it positions planet earth relative to the Sun as a whole. It is where still at that point, Twelve Primary Hexagrams and 24 Solar Terms come in only yet astronomically. You are from then on actually supposed to resort to Application (Yong) for anything else, be that Vibrancy for the Ten Gods relative to apparent season, where the Sun is in the sky, what type of weather you’re seeing and so on and so forth, until the latter wasn’t into question at all. To that respect, the person could be born during night time, which would strengthen Water elements in his Bazi birth chart, while Fire elements could be less vibrant. Person could have been born at noon time with clear skies and high temperatures, which would endorse Fire elements in the birth chart. In mind always that monthly Branches derive from the earth orbit around the Sun, thereby deciding the belonging Primary Hexagram, if then we involve season, the Water elements in the chart would gain on strength during Winter time, while in Summer the Fire elements would gain on strength, which principle becomes unaltered, no matter what Winter or Summer occurred on what Hemisphere. This means that, Body (Ti) would unequivocally decide on the Flying Star chart, the Bazi or 9 Ki birth map, but Application at all times requires for us to adapt to momentary vibrancy due to local conditions, but which bodes nothing new. Anyway, too many variables to account of Yong even for one single locality, so that environmental conditons would be notional at best and could never be taken as to decide calculations done to arrive at our basic charts. Earth magnetism and magnetic needle will be out as a player. Apparent season and apparent Sun path will be out as players. Hemispheres would be redundant and out as a player. With calculations established from astronomy and as it is, we would always adapt to seasons, time of day, time of year, air pressure, moisture, weather, cloudy or sunny, gender, age and what have you, whereas never would we adjust to account of Hemispheres. It couldn’t be, if only because seasons would flip along the course of any Solar year as it is and we would not be able to tell where at any time it will be sunny or cloudy, hot or cold, neither for the Northern Hemisphere at any time a year, nor for the Southern Hemisphere. Adaptation (Yong) also means, we would still grow our vegetables on the ‘sunny slope of the hill’, wherever we sow and harvest, but we cannot have the direction of the Sun at noon time, the direction of wind – or so many other conditions that would heavily rely on locality – to decide on basic calculations. 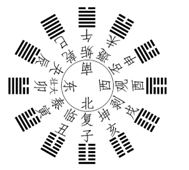 At the domain of 12 Primary Hexagrams, and still at this point very much astronomically so, December – or Zi Rat 子 – holds the December Solstice, while June – or Wu Horse 午 – holds the June Solstice. This progression applies for the entire planet as each time, it advances closer to the Sun and farther from the Sun. Same progression could be used for different domains, such as our 24 hour clock or for physiological means, such as chrono-acupuncture, but those may be outside the scope of this blog post, as one would be due to earth’s rotation, the other due to our personal magnetism, our Vital Qi. As the earth orbit around the Sun comes to concern of the planet as a whole, basic calculations anchored in 24 Solar Terms would be valid planetarily, because the planet passes through Solstices and Equinoxes as a whole. Seasons would be out as a player, if only because seasons will be due only to earth’s tilted axis, while in no way would seasons relate to position and distance of planet earth relative to the Sun on the ecliptic. The same would be true for the apparent Sun path, which, in terms of basic calculations, will be of no further consequence. We have to finally see that, at here stage, Primary Hexagrams are to show months, rather not seasons. It also means, we should as a field finally stop referring to planetary events as ‘Spring Equinox’ or ‘Winter Solstice’ and be doing Oriental metaphysics a bit more justice by using ‘March Equinox’ or ‘December Solstice’. However, advocates of both the North School ‘no difference’ and the South School ‘difference’, have been either one debating along Geocentric notions, until hypotheses on both sides would build on everything but 24 Solar Terms as derived from the earth orbit around the Sun. It would seem that, sadly, either subscribers to the ‘difference’ and the ‘no difference’ theory, can only still see 24 Solar Terms and 12 Primary Hexagrams in light of apparent season, rather not in light of the once-intended-by-the-ancient-astronomer ‘Yellow Belt’ aka earth orbit around the Sun. However, as a direct consequence of this and no matter if then you would have adhered to ‘no difference’ or ‘difference’ for Hemispheres, either way you would have in the mean time spent a lot of time on the internet, making sure to build more than a working knowledge to concern of earthly seasons, sundials, apparent Sun path, magnetism, magnetic field lines, compass behavior, weather patterns, Coriolis effect, if only for being able to join – then survive – discussions on the subject. Even if you thought that Flying Star charts and birth maps in Chinese Astrology were to be only constructed along universal calculations, true for the planet as a whole, so that there could be no difference, you’d better make sure to keep your knowledge to concern of seasons and magnetism up to date and in outstanding condition, as virtually no conversation would come to conclusion at just your no more than saying ‘since calculations derive from astronomical observations done with regard to the earth orbit around the sun, such players as magnetism and seasons are out‘. Where our feet rested once we recognized 24 Solar Terms along the earth orbit around the Sun, the Northern Hemisphere or the Southern Hemisphere, is of no further concern, also not if we had been able to locate the Big Dipper, or only yet the Southern Cross, not if we knew about the other Hemisphere, or if never once we stepped away from our country to remain on our Hemisphere. What had ultimately started the North-South issue, is authors’ at one point ‘thinking aloud’ in their book I Ching Astrology (1976). Even though out of print, you may still be able to obtain it. This book translates and annotates the ancient manuscript “Principles and Numbers of He and Luo River documents” (Heluo Lishu 河洛理數). To that respect otherwise invaluable, the book was a first time translation of Heluo Lishu by W.K. Chu (Zhu Wenguang 朱文光 1934-1986) and edited by decorated navy commander Wallace Andrew Sherrill (1910-1980). Probably, because of their rather more academic interest in the subject, but otherwise neither one practicing professionally, there were other propositions in their comments, but what would stand out is their supposition to have a year start at the December Solstice, then furthermore their noting that ‘the Chinese would have at one point not invented the magnetic needle’, while on top of this and in their view ‘the Chinese had not been on the Southern Hemisphere’. Because from one hypothesis may come another, and because they saw reversed seasons on Hemispheres, reversed Sun path, they suggested that further investigation should be done by the field, then calculations perhaps adapting for the Southern Hemisphere. The rest is history. The book was supposed to give your Yijing Life Hexagram based on your date of birth, but authors – well aware of both Solar calendar and Lunar calendar, eventually explain why they decided to base calculations on the latter. The Chinese had no knowledge of ‘a’ Southern Hemisphere at the time calculations for Feng Shui and Bazi were formulated, saying, now that we know about ‘a’ Southern Hemisphere, we would need yet make up for such fault committed by the ancient astronomer. Suddenly, the from earth orbit derived 24 Solar Terms were out as a benchmark, so that, after so many re-arrangements as to Chinese zodiac, Luopan and Luoshu, we’d in the mean time arrive to different Flying Star charts and birth maps for Four Pillars of Destiny and Nine Star Ki Astrology. As a side note and in the mean time, it was not possible to obtain your Yijing Life Hexagram using calculations proposed by Sherrill & Chu, until after Yijing instructor and author Harmen Mesker had gone through some long endured systematic work to amend certain mistakes in calculations, so that for the first time, it is possible to arrive to your correct Life Hexagram. 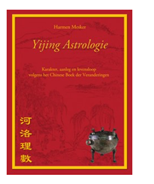 Currently in Dutch only, we would hope Harmen Mesker – “Yijing Astrologie” will soon appear in the English language. Previous post: Why would Feng Shui be termed Feng Shui?